Heritage pork you can now cook at home. 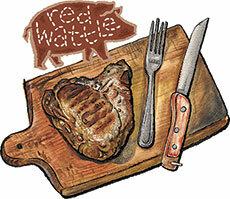 Red Wattles are an old breed of pig that was raised for flavor, not fashion. A century or two ago you’d have found Red Wattle pork on tables in New Orleans where they were a popular pig, sporting meat that could pair well with the region’s full-flavored cooking. Today you might find Red Wattle in a few restaurants in New York and a couple other lucky cities. There has been almost no supply for us home cooks—until now. We’re working with Heritage Foods to get a limited supply of big, fat, Red Wattle porterhouse pork chops. These chops have the strip and loin attached, joining at the bone like a T Bone steak. Each measures an inch and a quarter thick and tips the scales at fourteen ounces. The flavor is rich, herbaceous, even a little sweet. It packs more flavor than I’ve ever had in a pork chop. The crowning glory of Red Wattle pork, however, is its fat. It marbles the meat and wraps the chop in a soft, opaque band. When cooked it melts within the meat and softens its edge to a luscious, lip-smacking bite. This is melt-in-your mouth fat, the kind of succulent experience you expect in great steaks and some cured meats. It’s never a sensation I’d experienced in a pork chop until I met this one. The pork comes from hogs that are raised impeccably. The pigs are not confined, have access to the outdoors, and never receive antibiotics or hormones. This lifestyle is good for the pigs, but it doesn't make for uniform pork—the chops may vary a bit from piece to piece, rather than being identical. "Wow. Those Red Wattle pork chops were at least as good as described. My husband grilled them, and they came out perfectly medium rare (with nice grill marks). Four people enjoyed them immensely (and there was enough left over for my husband and me to have some for dinner the next day, with grainy mustard)." Chops ship frozen, though they may thaw and be cold, not hard, when they arrive. They come two to a pack. Because they’re thick they are best cooked using a temperature probe. The USDA recommends cooking to 160, but that’s well done and, in my mind, a shame for this quality of pork. I like medium rare to medium, 140 to 145. I've grilled them and cooked them in a pan and, in part because the grill is technically more difficult, I lean toward cooking them in a pan. Get it very hot, add oil, and cook them a few minutes on each side. They'll brown beautifully. Then put the pan in a 400 degree oven. Don't flip them again. Probe regularly until you get the temperature you're looking for.